BRISTOL - The Wethersfield boys basketball team hit six 3-pointers in the opening half to take a 14-point halftime lead and never looked back as it downed Bristol Central 68-49 on Monday night. The Rams closed the gap to six points with a solid third period, but the Eagles pulled away down the stretch to hold on for the win. The loss dropped Central to 6-9 for the season, still two wins away from postseason qualification. Wethersfield edged closer to the postseason, as the Eagles improved to 6-10. Donovan Clingan had 25 points and 15 rebounds to lead the Rams, with 14 of those points coming in the third quarter after a slow start. 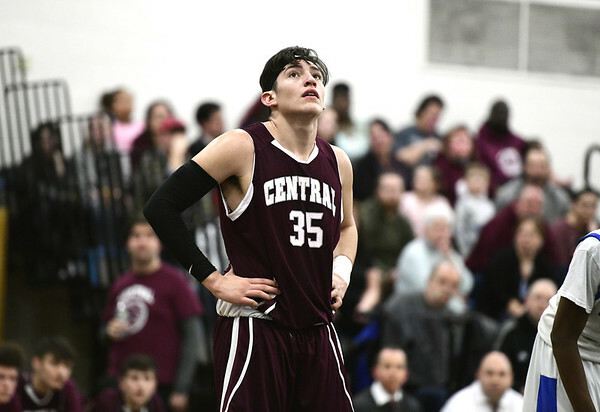 Ryan Rodriguez added nine points for Central. The Eagles finished the game with eight 3-pointers, including four from Derek Tenney, who was their leading scorer with 21 points. 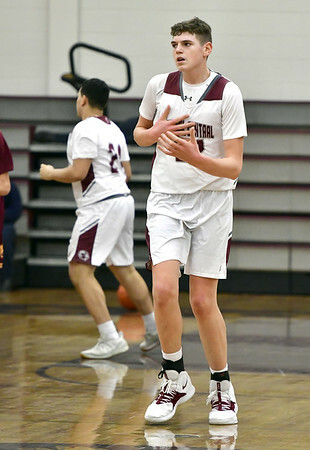 Bristol Central 62, Bulkeley 29: The Rams picked up their third victory of the season with a win in Hartford on Monday night. Bristol Central (3-14) was led by Ashley Watson (16 points), Kayla Beaulieu (13 points), Laney Maher (10 points), Gwen Torreso (9 points, 5 assists, 2 steals, 7 rebounds), Lia Roldan (6 points) and Ella Watson (5 points, 6 assists, 2 steals, 10 rebounds). Bulkeley (0-15) was led by Yadelis Gonzalez’s 11 points. Bristol Eastern 65, Wethersfield 56: The Lancers helped improve their seeding for state tournament play with a victory at Wethersfield on Monday night. Bristol Eastern (10-7) was led by Ciara Collins (20 points), Jordan Ouellette (17), Avery Arbuckle (8), Sage Scarritt (7) and Cali Doyon (6). Wethersfield (12-5) was led by Isabella Samse (19 points), Nicole Gwynn (17) and Alice Kelly (14). WETHERSFIELD: Jimmy Luiz 5-0-12, Norl Lopez 1-0-2, Luke Latina 2-1-6, Jack Romagnoli 1-3-6, Robert Ruiz 1-1-3, Tanner Selesinski 0-0-0, Derek Tenney 7-3-21, Joe Raposo 0-1-1, Mike Bielak 0-0-0, Liam Harrington 4-1-9, Jake Prunier 2-0-4, Andrew Derochers 0-0-0, Andre Burge 1-2-4. Totals: 24-12-68. BRISTOL CENTRAL: Victor Rosa 0-0-0, Royon Buchanan 1-2-5, Austin Brown 1-0-3, Mike Lorenzetti 0-0-0, Calvin Neal 1-0-2, Dillon Hudson 0-0-0, Nate Rosa 0-0-0, Shane Ouellette 1-0-3, Damion Glasper 0-0-0, Sean Wininger 1-0-2, Donovan Clingan 9-7-25, Maliki Matthews 0-0-0, Ryan Rodriguez 4-1-9. Totals: 18-10-49. Three-point goals: Tenney (W) 4, Luiz (W) 2, Latona (W), Romagnoli (W), Brown (BC), Ouellette (BC), Buchanan (BC). Records: Wethersfield 6-10, Bristol Central 6-9. BRISTOL CENTRAL: Kayla Beaulieu 5-3-13, Allison Jessie 0-1-1, Laney Maher 5-0-10, Haley Riley 1-0-2, Lia Roldan 2-0-6, Gwen Torreso 4-0-9, Ashley Watson 8-0-16, Ella Watson 2-1-5. Totals: 27-5-62. BULKELEY: Shania Benson 3-1-7, Yadelis Gonzalez 4-0-11, Katelyn Oquendo 3-0-7, Zulekya Solder 1-0-2, Cassandra Ganga 1-0-2. Totals: 12-1-29. Three-point goals: Roldan (BC) 2, Torreso (BC), Gonzalez (Bul) 3, Oquendo (Bul). Records: Bristol Central 3-14, Bulkeley 0-15. BRISTOL EASTERN: Avery Arbuckle 3-2-8, Ciara Collins 6-7-20, Cali Doyon 2-2-6, Meredith Forman 1-2-4, Paige McLaughlin 1-0-3, Jordan Ouellette 8-1-17, Sage Scarritt 2-2-7. Totals: 23-16-65. WETHERSFIELD: Zoe Adams 1-0-2, Isabella Samse 7-4-19, Alice Kelly 4-2-14, Grace Conneely 2-0-4, Nicole Gwynn 5-7-17. Totals: 19-13-56. Three-point goals: Collins (BE), McLaughlin (BE), Scarritt (BE), Samse (W), Kelly (W) 4. Records: Bristol Eastern 10-7, Wethersfield 12-5. Posted in The Bristol Press, Bristol Central, Bristol Eastern on Tuesday, 5 February 2019 16:20. Updated: Tuesday, 5 February 2019 16:23.